Once again St Andrew’s Church is host to over 20 charities and community groups including Crazy Hats, Cransley Hospice, Accomodation Concern, Action for ME, Kettering Samaritans,Kettering Community Unit Andi Bull Cancer Charity and many more for our annual Community Christmas Fair, and amongst the stalls, refreshments and activities there are performances by several local school choirs. The Fair opens its doors on Thursday 7th December 2017 from 6pm until 9pm and on Saturday 9th December 2017 from 10am until 2pm. There will also be a very special guest in red, with a big white beard!! 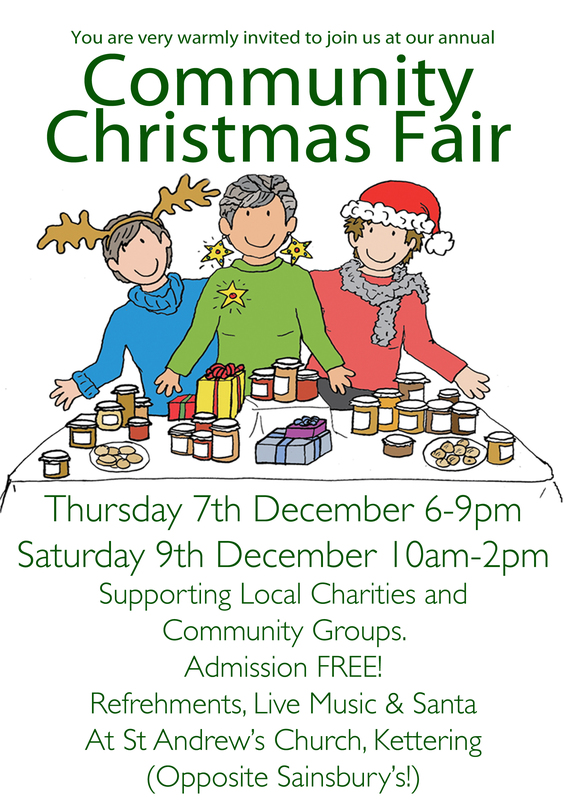 As a local charity we are very interested in receiving some more information about be able to be part of your next Community Christmas Fair. Our charity is “The Andi Bull Cancer Trust”, which was set up when Andi was given the news that his cancer was terminal. He wanted to be able to make life in hospital a bit more comfortable for young people suffering with cancer, as he found when he was in hospital he felt very isolated. So far we have funded KGH with DVD players, DVD library and television and looking at installing wi-fi, so they can carry on being normal teenagers during their treatment. we would love you to get involved with our Community Fair if possible. It sounds as if you do great things for young people suffering with cancer in Kettering. Email me on willsbecky@googlemail.com and I’ll send you the contact details for our Fair organiser. Hey, is anyone allowed a stall to sell etc at this Christmas fair? If so how much is it?